Microsoft tightly combine their applications together however sometimes it’s nice to escape from Microsoft Products and use others. Here I demonstrate how you can use Google Mail to send out an e-mail from an Internet connected PC, and you can also do this covertly! This basic example sends a simple, no-frills text message every time the script is run: Example File: script0603.vbs As you can see, the original file was a VBScript file; I have converted this to VBA. If I wanted to take it to the next level and add an attachment to the Build a Message section of the code. Under oMsg, what code would I add to have it grab a report or query and email it as an attachment. 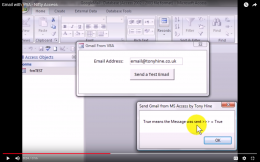 This YouTube “How to send email using Gmail via Excel VBA” from Dinesh Kumar Takyar demonstrates how to send Gmail from MS Excel with VBA. CJ London asked the Question:- sending is pretty straightforward – but can you receive gmail into access? There’s a sample database on Colin’s site which looks interesting. Click on the link below and follow the instructions. I checked with Colin and it does use CDO. In any event it looks like an interesting example, well worth exploring.